Tesla Inc. on Thursday (16), unveiled a prototype electric big-rig truck that it will start producing in 2019, throwing itself into a new market even as it struggles to roll out an affordable sedan on which the company’s future depends. Chief executive Elon Musk unveiled the big rig, dubbed the Tesla Semi, by riding the truck into an airport hangar near Los Angeles in front of a crowd of Tesla car owners and potential buyers. Later the semi truck opened its trailer, and a new Roadster drove out. Some analysts fear the truck will be an expensive distraction for Tesla, which is burning cash, has never posted an annual profit, and is in self-described “manufacturing hell” starting up production of the $35,000 US Model 3 sedan. Musk did not give a price for the truck. The truck can go up to 800 km at maximum weight at highway speed, Musk said. Diesel trucks are capable of travelling up to 1,600 km on a single tank of fuel. Musk said diesel trucks were 20 per cent more expensive per mile (1.6 km) to operate than his electric truck. The Tesla Semi can also go from 0 to 96 km/h in five seconds without cargo or reach 96 km/h in 20 seconds at the maximum weight allowed on U.S. highways of 36,300 kilograms. “I can drive this thing and I have no idea how to drive a semi,” Musk joked. 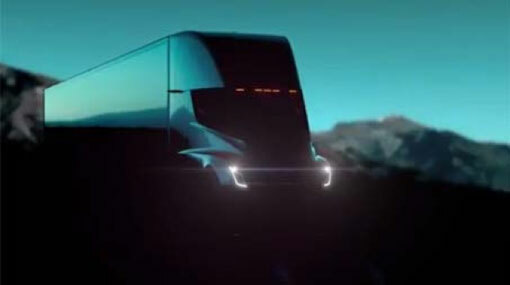 Ahead of the unveiling, Tesla executives showed off the Class 8 truck to journalists, describing it as “trailer agnostic,” or capable of hauling any type of freight. Class 8 is the heaviest weight classification on trucks. The day cab — which is not a sleeper — has a less prominent nose than on a classic truck, and the battery is built into the chassis. It has four motors, one for each rear wheel. Tesla designed the cab with a roomy feel and a centre seat for better visibility, executives said. Two touch screens flank the driver. The truck has Tesla’s latest semi-autonomous driving system, designed to keep a vehicle in its lane without drifting, change lanes on command, and transition from one freeway to another with no human intervention. Reuters reported in August that Tesla was discussing self-driving trucks with regulators in Nevada and California, but the company did not mention full autonomy in a release on the new vehicle. Tesla will guarantee the truck’s drivetrain, which delivers power to the wheels, for one million miles (about 1.6 million kilometres). Old Dominion Freight Line Inc., the fourth-largest U.S. less-than-truckload carrier, which consolidates smaller freight loads onto a single truck, said it would not use the Tesla truck. “We met with Tesla and at this time we do not see a fit with their product and our fleet,” Dave Bates, senior vice-president of operations, said in an email, without elaborating. Tesla faces a much more crowded field for electric trucks than it did when it introduced its electric cars. Manufacturers such as Daimler AG, Navistar International Corp and Volkswagen AG are joining a host of start-ups racing to overcome the challenges of substituting batteries for diesel engines as regulators crack down on carbon dioxide and soot pollution.